Colette Amaral is a professional decorator with years of experience working with clients. Prior to founding Beyond Clutter Interiors, Colette worked in textiles and as a design consultant on a number of real estate projects. Working in these industries, Colette developed an approach that combines elements of textile design such as texture, colour, and pattern, with her clients' needs for functional, livable space. 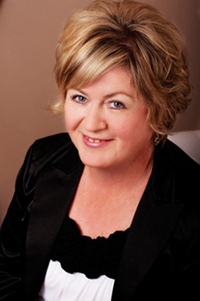 From Beyond Clutter's founding, Colette has enjoyed success and publicity for her work. Her pieces have appeared in the Fabulous Homes section of the Vancouver Province, and she was invited to decorate the PNE Prize Home in 2009 and 2010. From the moment I laid eyes on Colette's Media Room at the PNE Prize Home, I knew I had to work with her again. "There are very few designers that understand the scope of the target market when designing a room for mass appeal. Colette gets it!" She understood having Neutral Tones as the major pieces (who doesn't get that part! ), but she took it to the next level by incorporating textures such as sequence and fur that really added depth to the room. Which is why I asked Colette to help with decorating our Thomasville and Lane Booths at the 2009 Vancouver Home & Interior Design Show. Our Glamour Rooms at the Show were accomplished thanks to Colette's talent for working within our parameters and really absorbing our vision, then of course, with Colette's Finesse our Booths really shined! We are all in good hands with Colette. © Beyond Clutter Interiors Inc.